It feels like summer just got started, yet there is starting to be advertising for back to school shopping. 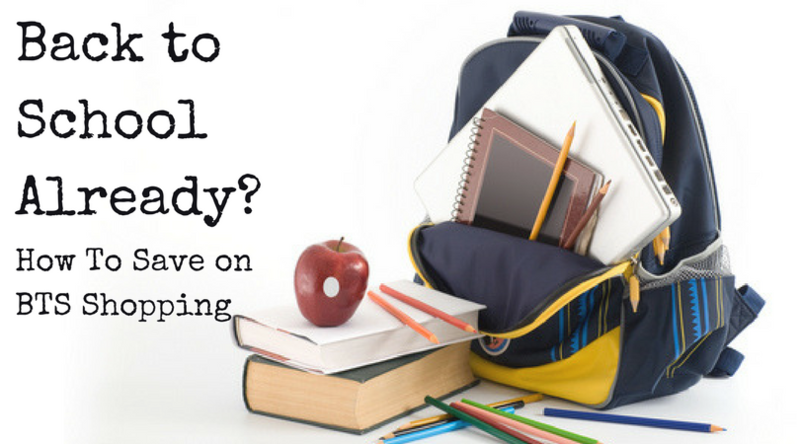 The first day of school is earlier each year it seems, and the pressure to be ready is immense. You might assume that the advertised prices now are the best ones, but some things will be a better value later. There are several ways to get the supply list. Office supply stores will have them for local schools, you can get them from the school’s website, or if the school office is open, go in person to get a copy. When I was a kid, the list was passed out the first day of school; getting it in advance is so much easier. I swear, other than required school supplies, there is no rush for the rest. The very best way to save money is to be a smart shopper which often means spending more time to research prices. And as far as clothes, there is no need to buy everything at once. You can spread out the expense over the course of the year, and your kids will get new things more often and get some variety that way. Other ways you can get extra savings are with coupons, watching sales, checking at used clothing stores, or using an online shopping portal. Ebates and Giving Assistant will give you cash back for shopping online and in person at some retailers. It used to be that the tax-free shopping was just on clothing, but in some states, it has expanded to include items like backpacks, computers, and school supplies. There is a dollar limit, for instance, most states limit the clothing exemption to items up to $100 each. Here is a link to a page that gives the dates and items included for each state. School supplies like pens, pencils, crayons, paper, printer ink, and notebooks are a great value at warehouse stores like Sam’s Club and Costco. Since they don’t have an expiration date, if you have room to store some extras, you can reduce the chance of last minute trips out to replace items. Back to school is only stressful if you let it be, so stay calm and take your time to get the best bang for your hard-earned money. Here at BillCutterz, we understand how important it is to maximize your savings, so hopefully, some of these tips will make a difference for you. We enjoy saving money here at BillCutterz if you have any other ideas or questions feel free to share in the comments below.